2nd Association Exchange Forum, held on 19-22 September, in Kyiv, Ukraine brought international experts and policy-makers to discuss progress made on the implementation of EU Association Agreement in Georgia, Moldova and Ukraine. The focus of this year’s Forum was to tackle questions on economic integration and shared experiences of negotiations, leading to the implementation itself. The Forum also addressed important, sector-specific issues related to integration into EU internal market – and the situation after visa liberalisation. This could not have been done without thorough discussion on EU’s present involvement and policy instruments – not only in the region, but also further afield, in the Balkans and other parts of the neighbourhood. 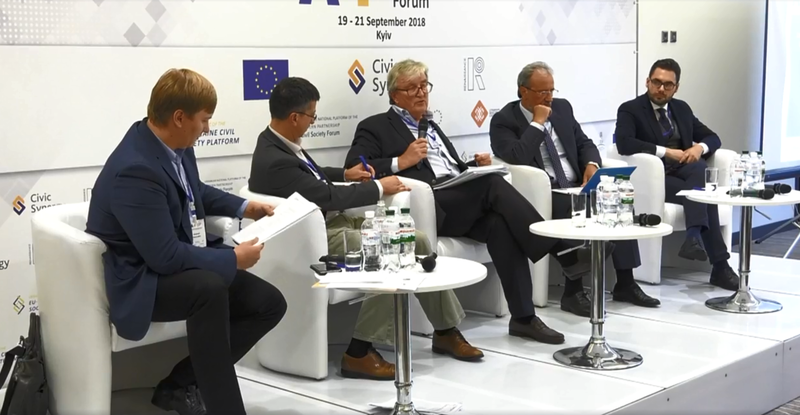 Eastern Partnership Civil Society Forum (EaP CSF) lead the session on 2020 Deliverables – with Hennadiy Maksak, Steering Committee member and Ukraine Country Facilitator, moderating a joint panel discussion on the second day. Krzysztof Bobinski, EaP CSF Steering Committee Co-chair, Kakha Gogolashvili and Iulian Groza were among those invited to speak. Later sessions draw participation from other EaP CSF members: Iryna Sushko, Denis Cenusa and Lasha Tugushi. The four day event was organised by Civic Synergy Project – together with EU-Ukraine Civil Society Platform and EaP CSF Ukrainian National Platform, with the support of International Renaissance Foundation, ESTEP Consultancy and institutional partners: Governmental Office for the Coordination of European and Euro-Atlantic Integration of Ukraine and the Ministry for Foreign Affairs of the Republic of Lithuania. More details, including full agenda, live-stream recordings and experts’ publications, can be found on 2nd Association Exchange Forum website.